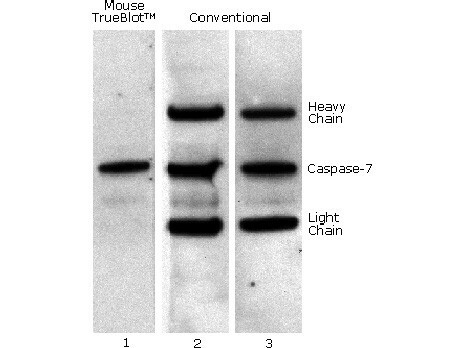 Mouse IgG TrueBlot® ULTRA is a unique anti-mouse IgG immunoblotting (second step) reagent. Mouse IgG TrueBlot® ULTRA enables detection of immunoblotted target protein bands, without hindrance by interfering immunoprecipitating immunoglobulin heavy and light chains. Mouse IgG TrueBlot® ULTRA is provided as 1000X solution.